It’s Election Day in the United States. It’s a national civics lesson in which we celebrate democracy and the role of the people in governing themselves. In the United States, this civics lesson describes our form of government as a representative democracy. People vote for representatives. The person who gets the majority wins and is supposed to represent the interests of the voters. This is the form in which Americans “share in the rule,” the phrase Aristotle uses to describe what citizens do in political life to distinguish political life form master rule where the ruled do not participate in the rule but are entirely subject to rule. 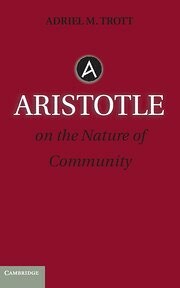 Both the sharing in the rule and the ruling for the sake of the ruled are markers, Aristotle tells us, of political rule in contrast to master rule. I remember debating in high school social studies whether elected representatives were supposed to act in accordance with the wishes of the people who elected them or if they were supposed to make their best judgment about what would be right having been elected on the supposition that they were not so much the holder of every position of those who voted for them but rather considered the best person at making the right judgments. Elected officials have even explained votes by saying they had to do what their constituents wanted even if they disagreed. This debate still seems within the domain of different perspectives of representative democracy. A friend posted something on Facebook about how our rulers were deciding among themselves and I was struck by how very true that was. In a more emphatic sense than has been the case before, it seems that we are no longer appointing representatives, we are being ruled. Some people might say it has long been that way, and they are not wrong. The American system has long tried to keep the people at some remove from the real decisions. Consider the Senate’s composition of two senators from each state no matter how small. This calculus led to our situation today in which 51 Republican Senators represent 143 million people while 49 Democratic Senators represent 182 million people. Gerrymandering is so severe that there is some fear that the Democrats will win a majority of votes for House seats while losing the House. We never did really support the One Person, One Vote principle. But that’s not the only reason that we are ruled rather than represented. Public choice theory is the idea that elected officials themselves could be considered and studied as economic actors, as having their own interests that drive their actions. While there is a lot of debate about public choice theory this definition is uncontroversial. In the summary of it at the beginning of this article in Forbes, the author cites the theory itself as if it is conventional wisdom and so clearly unrelated to say, promoting segregation. But I hold public choice theory at least in part responsible for our situation of being ruled. Public choice theory appeared to study a phenomenon that it was in fact producing by suggesting that elected officials needed to be self-interested rather than concerned with good representation. Coupled with the power of big money in electoral politics, elected officials became motivated to be invested in holding on to their seats and thus to vote the way the money was rather than in response to people. They had to associate with the people who give them money and became invested in the moneyed interests. I think one element in this is the way that elected officials–Democrats as much as anyone–act out of fear rather than out of courage and thoughtful commitment to what would serve the citizenry. They see midterm elections as occasions in which they have to pick up a tiny slice of voters who might swing their votes instead of seeing the opportunity in the wide swath of people who never vote because they know the rulers rule for themselves. They develop platforms that appeal to the middle, people stay home because they haven’t motivated anyone to vote, and then they blame the nonvoters, when they could be speaking to the concerns of the people who never vote. Public choice theory led politicians themselves to stop thinking in terms of what was good for their constituents and literally encouraged them to think in terms of their own self-interests. They became rulers instead of representatives. They became invested in not sharing the rule, in not taking turns. If we want representatives, we need to eliminate the electoral college and change the composition algorithm of the Senate, both anti-democratic mechanisms to preserve the power of the few. But we also need to change the way that politicians think about their position away from public choice theory and toward civil service. For this shift to happen, they need to be disincentivized to think in terms of their own self-interest apart from the interests of those they rule. Economists create ideal systems and then study the world as if it fits in that system and try to explain it accordingly, all the while that system produces the incentives it needs for it to really work that way so that their studies would be accurate. Public choice theory is no different.